Review: Are you anxiously searching for a mystery that will keep your eyes reading all day? Then the 10th book in the Chet Gecko Mystery series is for you. 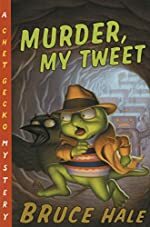 Murder, My Tweet by Bruce Hale is a mystery that stars Chet Gecko, an investigator who is trying to figure out who is blackmailing the vice principal of Emerson Hicky Elementary School. Natalie, Chet Gecko’s friend, is a parakeet who gets suspended because Vice Principal Shrewer sees Natalie pick up the blackmail note. However, even though Ms. Shrewer saw Natalie, the blackmailer is someone else! Can Chet Gecko get his friend out of trouble and solve the mystery? The blackmailing scheme causes a great deal of problems in the school. Although Natalie is blamed, she isn’t the blackmailer. Natalie knows that T-bone, a ringtail lemur who wants to be in the rock band known as Stench Bombs, is really the blackmailer – well at least one of them. Chet and Natalie meet up in a tree to discuss their plans for finding the blackmailers. Through sneaking around and looking for clues, Chet and Natalie come closer to finding the truth. I liked Murder, My Tweet because mysteries are my kind of book. Sometimes I pretend to be a secret agent – a lot like Chet Gecko! I especially liked the part when Natalie is allowed to go back to school. Also, another good part of the book is when Chet pours brown soup on battery controlled robots! The robots fall to the ground in a puddle of brown soup – now that’s not something you get to see every day! This was my first time reading a Chet Gecko book and this has inspired me to read more of them. Some parts of the book felt like I was watching TV in my head. There are many other things I like about the book, but I don’t want to spoil the book for you! I hope you think the book is as funny and enjoyable as I do. Review written by Andrea, Grade 5. Date of review: July 2009.